Many companies send gifts over the holidays to their customers and clients, but what types of gifts show that you seriously appreciate them? Here are some ideas. If you've ever had a job that handled regular customers or clients on a daily (or weekly) basis, you might have encountered the traditional holiday business gift. These vary from fruit, to chocolates, to promotional logo gifts... but which gifts do the recipients really love and appreciate? You're about to find out. During busy holiday seasons, companies tend to get bogged down with orders and business. With this being the case, many times the employees do not get a chance to get out of the office and grab lunch or a snack. That's where you come in. Sending a corporate gift basket packed with goodies like pretzels, chips, chocolates, nuts, cheese and crackers, can often be the most appreciated thing around the holidays. The employees will remember you sent them a saving-grace during their most critical timeline, and will think highly of your brand. Can't beat that, can you? Have you received a corporate gift before? More and more popular these days, are these gourmet gift towers. These are typically boxes layered at different sizes to look like the ultimate luxurious gift. The thing is, they are not as expensive as they might look, that's the nice part! You get a beautiful-looking gift and end up spending less. These gift tower layers are often filled with yummy treats like gourmet popcorn, chocolate-covered crispy pops, pretzels, biscotti, chocolate-dipped strawberries, chewy pecan turtles, English toffee, chocolates, pistachios, peanuts, coffee, tea and lots more. Doesn't it always seem like we get a sweet tooth right around holiday season? I'm not sure what it is, but I'm always craving chocolate along with any kind of sugary treat. But when it comes to giving corporate chocolate gifts, there are certainly plenty of options! You could start by sending a gift basket of Godiva chocolates, which is an easy and affordable option. Or you could take to imprinting chocolate with your logo or business mantra. The neat thing about these imprinted chocolates is that they are a more unique form of marketing, while providing the recipient a little treat. Customize the wrapper, the chocolates, and send a handwritten thank you note along with your gift for the maximum effect. When you have customers that are from a specific niche market, then why not consider catering to that? These cookie bouquets are customized already for those clients. Sending a gift to a doctor's office or dentist office? There's a cookie bouquet for that! Here is a list of cookies by profession. These gifts are good for small offices like a dental office or law firm where the whole crew can each enjoy their own cookie with their morning coffee. You can't go wrong! Sidenote: These cookies typically come in bouquets of 5, 7, 9 or 12 cookies. Of course when you are sending your gifts, you want to make it relevant to your industry or represent your brand. You don't want your gift to be just another package that arrives at their office. Put some thought into your decisions and be willing to spend a little more to please your customers. You won't regret it in the long run! Which corporate gift would you prefer to send your customers? 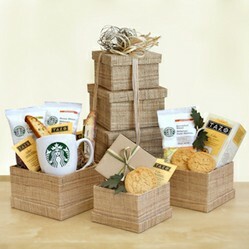 Great gift ideas and I love the cookies by profession. The dentist bouquet is adorable! Here are some Christmas gift ideas that your boyfriend might enjoy. Includes Grumpy Cat Classical Painting cards, Grumpy Cat Mona Lisa cards, and more useful things.